Hot dogs are a standard in the concession stand business, and they happen to be one of the most popular foods in the country. In order to start a hot dog stand, you will need to make sure that you have the right equipment. For about $7000 or less you can purchase all the necessary equipment, including the stand, cookers, coolers, and more. For a few thousand more, you can even purchase a customized trailer. However, if you don’t have that kind of money, there other options available to you. If you have the money, it is usually the best option to purchase new equipment. New equipment comes with a warranty and is backed by the store where it was purchased. However, there are many opportunities to purchase used equipment that is in good condition. Although you won’t always know where it has been or what condition it is in, used equipment will usually cost about half the price of new equipment. If you do not have the money to purchase equipment outright, you can look into leasing new equipment. Leasing is a cost effective way of getting new equipment without having to come up with the entire purchase price. Another reason many choose to lease equipment is to avoid spending too much money up front on a business they might not continue. Leasing can give hot dog stand owners an easy way out if they want to give up their business down the road. A good hot dog stand is a part and parcel of your hot dog business. Choose a stand or cart that is easy to transport from place to place. You can purchase a pre-made stand or a new or used cart. You can also build your own stand from online plans. Whichever option you choose, make sure your stand meets all of the necessary city and state health and safety standards. It should have a sink for washing and cleaning, a water tank and a waste water tank. You might need propane or LPG tanks to cook with, so it is a good idea to keep an extra tank on board in case you run out. Hot dog stands usually require a fire extinguisher as well. Also take into consideration protection from the sun and other elements, and choose some type of awning or umbrella for your cart or stand. Determine how you want to cook your hot dogs before you start looking for equipment. Do you want to broil them, grill them or steam them? Whichever you choose, your stand will need the appropriate equipment. Decide upon other items that you want to sell and determine which type of cooking equipment these foods will require. At the least you will need some type of a cooler, since hot dog stands usually sell soda. A big consideration is having adequate storage space and holders for buns, hot dogs, condiments, napkins and other items. The more storage space and condiment station supplies you have, the easier it will be to set up and run your stand. Adequate storage, food containers, and display racks can also help with the overall organization and appearance of your stand. 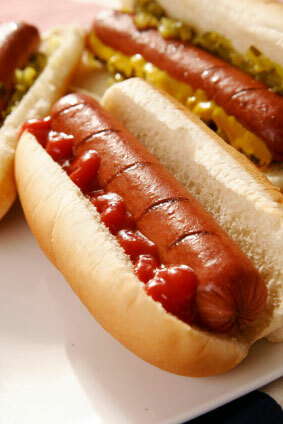 What are some of the other basic supplies and equipment your hot dog stand will require? Oven mitts and gloves are important as they make working with the steamer or grill safer. Cleaning supplies are important for cleaning up at the end of the day, and during quiet times. A safe place to store your money is also a high priority item. Large stands and trailers might need a cash register, while a locked money box and a credit card machine may be fine for smaller stands.